HARDISTY, AB – We all face loss, eventually. And often we – along with our friends, co-workers, and family members are not sure what supports are available. 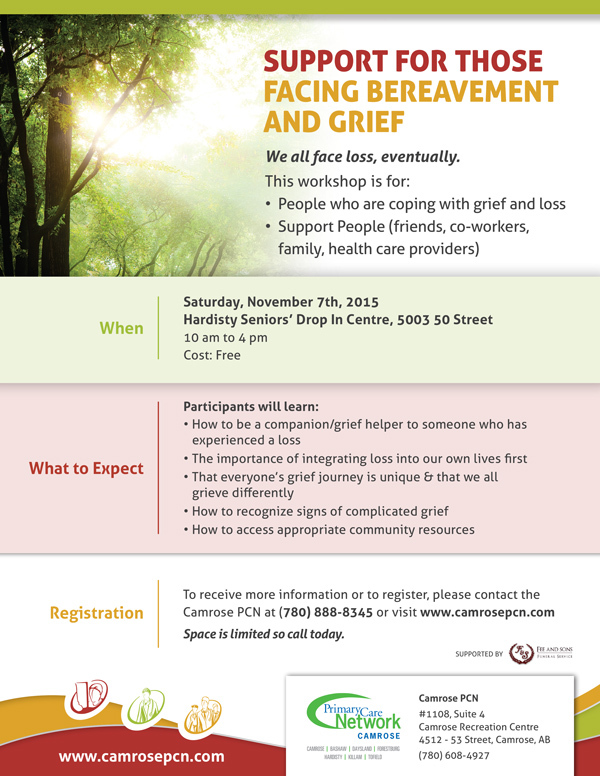 The Camrose Primary Care Network (PCN) is pleased to offer a one day Grief and Bereavement workshop on Saturday, November 7th, which will explain the differences between bereavement, grief and mourning. • How to be a companion/grief helper to someone who has experienced a loss. • The importance of integrating loss into our own lives first. • That everyone’s grief journey is unique & that we all grieve differently. • How to recognize signs of complicated grief. • How to access appropriate community resources. This free workshop, being held at the Hardisty Seniors’ Drop In Centre (5003 50 Street) will run from 10 am to 4:00 pm and includes lunch, courtesy of Fee and Sons Funeral Services. "The PCN is very appreciative of Fee and Sons Funeral Services in offering to support this workshop in Hardisty," states Strilchuk. “They see the value in having this type of service available and we are pleased to work with them moving this forward for the community members in and around Hardisty. We want to thank them for sponsoring the lunch, room rental and advertising for this event." To receive more information or to register, please contact Stacey Hudson, Camrose PCN nurse at the Hardisty Medical Clinic, at 780.888.8345 or email her at stacey.hudson@camrosepcn.com. Space is limited so call today. Registrations will be taken until November 4th, 2015.